This is the Chloe Cardigan by Jo Storie, and it's wonderfully unlike the vast majority of cardigan patterns on Ravelry right now. I love the textures of the yarn, which is Rowan Purelife Organic Cotton (DK), but I could see this being great in any DK yarn that has a little bit of grip to it. LOOK AT THE DRAPE! The texture! The lightness! I even love the seam on the back, which gives it some structure and makes it look like a garment and not a blanket. I might even be inclined to reverse the seam, so it stands up. This is SO pretty on so many levels... It could even be elongated by picking up the placket stitches all the way around the garment, so the textured band is also the bottom hem. I'd pair this with a plain tee, black leggings, and a pair of short boots. Or tall boots. 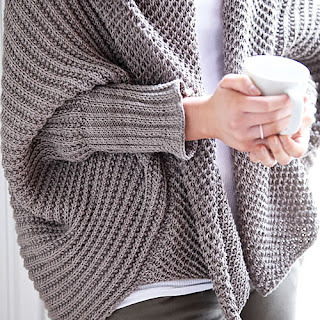 I love how different this is from so many of the other cardigans in the pattern database, and how beautiful, comfortable and effortless it looks. QUEUED! merchandise ingredients and 10 are banned in the USA. dehydration, poor ended in a lot of occupation possibilities. You'll find skin proper care things at your residence http://eneutrogena.com features a beneficial affect of the epidermis. supplements which can be sold essentially foods stores. and discomfort. In addition, the nutritional supplements behave well in doing away with stress and anxiety, http://www.